Landscape of generally large rectangular fields towards the floor of the valley and along the Dwr Iâl stream. The earliest evidence of human activity is provided by a Bronze Age perforated stone macehead found in a field between Wern Farm and the Afon Iâl. The medieval church to the north-east of the present settlement was the focus of the medieval parish of Llanbedr in the commote of Dogfeilyn on the eastern edge of the ancient cantref of Dyffryn Clwyd. 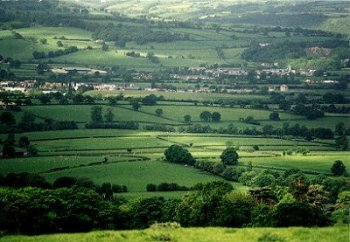 The area lies on gently sloping ground on the eastern side of the vale, at a height of between about 50-150m. The eastern side of the area forms part of the Clwydian Range AONB. The village of Llanbedr Dyffryn Clwyd is a relatively modern nucleated settlement 18th- to 20th-century brick and stone houses with slate roofs and stone 18th-century inn and toll house on the former toll road between Ruthin and Mold, later 19th-century church, and 20th-century council house estate. The earlier, medieval, church lies in parkland about 2 kilometres to the north-east of the present church and included in the Hirwaen character area. Farms are generally fairly large and widely spaced, 500m or more apart. They are normally set within their own fields and avoiding the narrow strip of damper lower-lying land along the Dwr Iâl stream. Of these, Caerfallen is a late 16th/early 17th-century timber-framed farmhouse with stone gables, brick chimneys and stone outbuildings, and Wern is a late 18th/early 19th-century limestone farmhouse with tile roof and stone outbuildings. Plâs-yn-rhal is known to have been in existence by 1592. The ?18th-century former rectory on the road to the north of Llanbedr is of brick with a slate roof. Later rural settlement is characterized by small groups of 18th- and 19th-century stone and brick houses and cottages typically developed on road junctions, as at Ty'n-y-groesffordd and Groes Ucha and at Llanbedr itself, with some scattered and isolated late 19th- and twentieth-century roadside houses elsewhere. Generally large rectangular fields set out along or up and down the slope with irregular boundaries along stream courses and occasional irregular boundaries possibly representing earlier enclosure. Boundaries are mostly low, well-maintained mature hedges of hawthorn, holly and ash, occasionally associated with very low banks. Scattered larger mature ash and oak and taller trees and shrubs, including alder, along stream courses. Judging from a number of the larger farmhouses in the landscape, such as Caerfallen and Plâs-yn-rhal, it seems probable that the basic framework of the landscape represents late 16th- to early 17th- improvement and enclosure of low-lying unenclosed meadow land, possibly incorporating parts of some small areas of former unenclosed medieval arable land. Occasional hedges have been removed and are visible by lines of larger trees or in some instances by tree stumps. Occasional single or double ?19th-century stone field gateposts on public roads. Lower-lying ground has a tendency to waterlogging and a number of the streams running through the fields are embanked to prevent flooding. The principal roads run in slight hollow-ways. ?Late 18th-century single round-arched stone bridge with coping stones on parapet over Dwr Iâl stream. A small area of parkland surrounds the large late 18th/early 19th-century house at Berth.